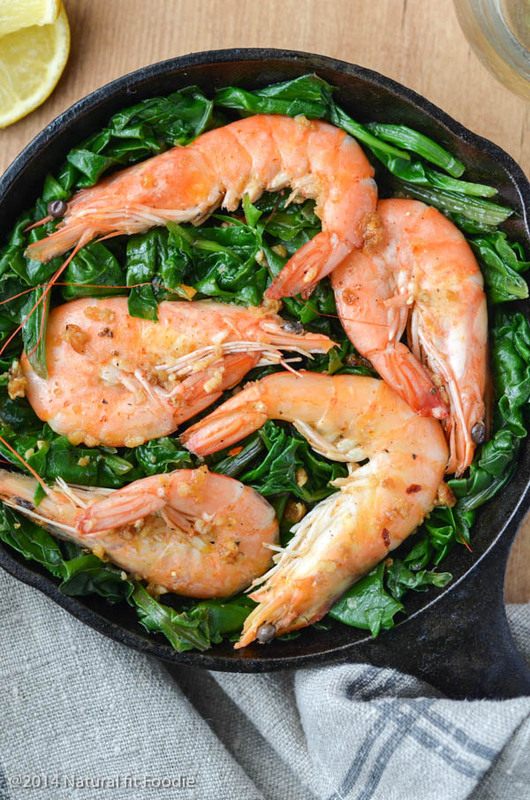 Shrimp with Swiss Chard is a simple yet elegant meal. It’s quick and easy with less than 5 ingredients. I always try to incorporate seafood at least twice weekly when planning my family’s meals. Normally I will add tuna or sardines to our daily salad but I also include an appetiser or main dish which is seafood based. It really is that easy to get your two recommended servings of seafood in per week. Seafood is any form of sea life used as food by humans. This includes fish and shellfish. Seafood has essential omega-3s. Low seafood intake contributes to 84,000 deaths each year, making seafood deficiency a leading dietary contributor to preventable death in the U.S. 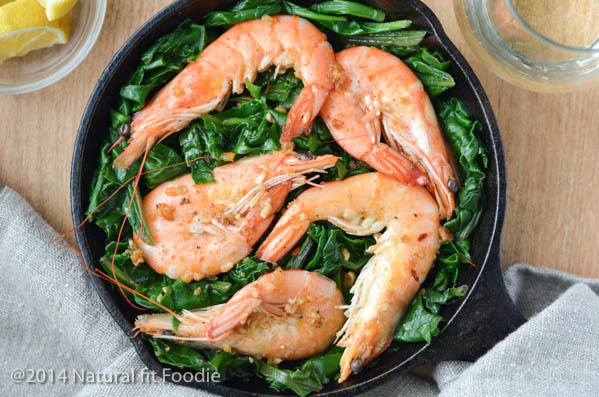 Eating seafood can literally save your life! Heat extra virgin olive oil in a skillet with chopped garlic. Add shrimp and cook for 1 minute. 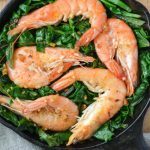 Add swiss chard and white wine to the skillet. Cook altogether on a low heat until wine is absorbed. Add salt and pepper to taste. Serve immediately as an appetiser or add some steamed quinoa for a healthy meal. If you struggle to get more seafood on the table I invite you to take the Healthy Heart Pledge– That means you recognize seafood is a healthy choice for you and your family and you’ll pledge to eat at least two servings of seafood each week and supplement with omega-3s. To make the challenge even more fun the folks over at the Seafood Nutrition Partnership are hosting the Seafood Nutrition Partnership 2016 Recipe Sweepstakes from August 15th to October 21st. All you need to do is show how simple, delicious and nutritious seafood can be for a chance to win. A total of ten winners will be randomly selected in accordance with the Sweepstakes Schedule to win a $250 gift card. You can even submit one entry per day. Winners will be announced at SeafoodNutrition.org and on Instagram and Twitter. So what do you think? 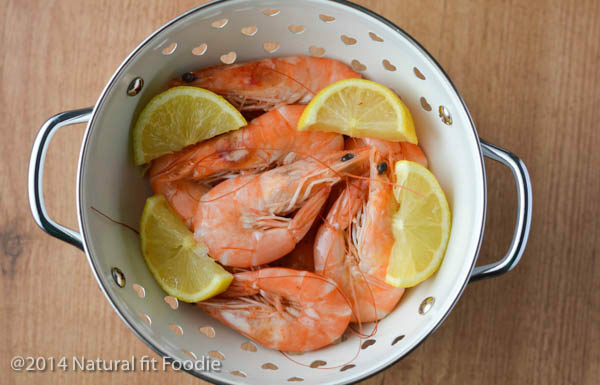 Will you try to incorporate more seafood into your diet? 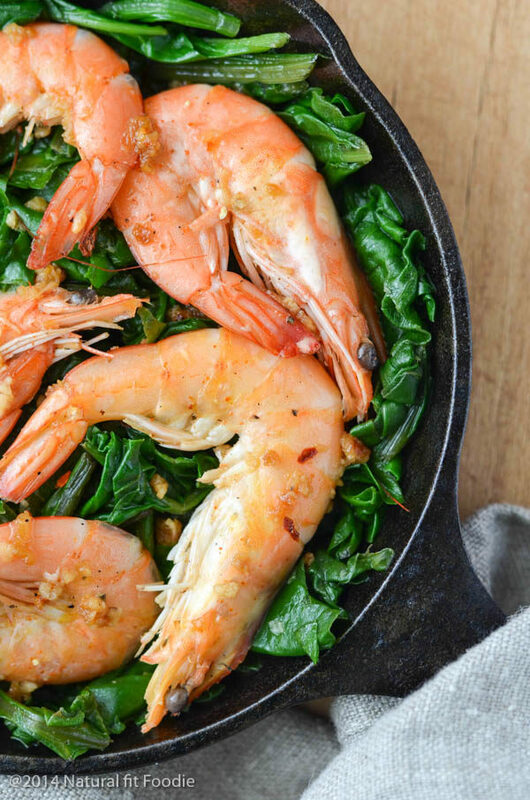 Shrimp with Swiss Chard is a simple yet elegant meal. It's quick and easy with less than 5 ingredients. this looks amazing….the size of those shrimp! I love this! So fresh and simple. My kind of dinner! It’s a family favourite Linda! Gorgeous in its simplicity! Thanks for the reminder that it doesn’t have to be fancy to be delicious! Easy, healthy and light…all great combos! I have to agree with you there Megan! I use to hate seafood. For some reason I love eating it now. Love your recipe. This is so lovely. Simple and elegant at the same time. My husband would love this, shrimp is one of his favorites. Well, you know with a fisherman husband I’m eating more than my two servings of seafood each week! Lucky girl! 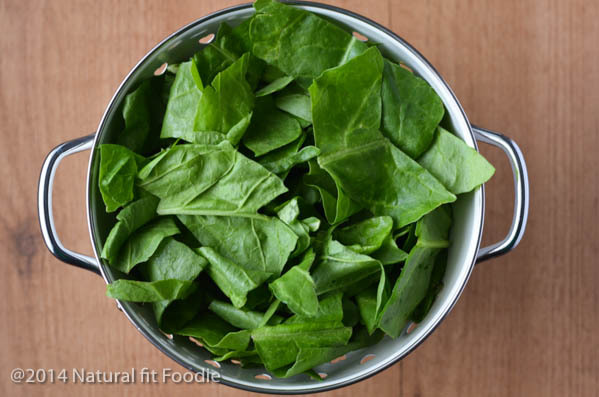 !Funnily enough my family loves swiss chard more than spinach, or kale or any other dark green leafy greens. I love the way you photographed everything! Do you keep the shells of the shrimp on? Thanks Cassie. I cook the shrimp with the shells on but remove them before eating.